A new year with new craft and sewing projects. How exciting! Here is a simple one to start out with for the year. Remember that ballet hobo dance bag I made for my daughter? Well, I made one for myself. 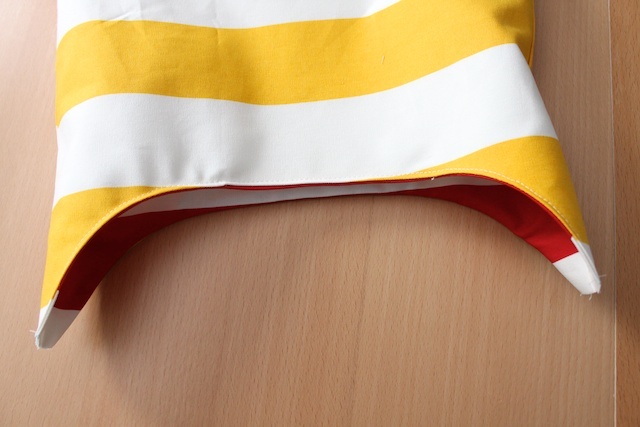 This time I made it reversible yellow and red stripes. It’s one of my grab-and-go bags where I drop my wallet, phone and keys in there and go. I switch colors depending on what I am wearing or my mood. Remember, if you make something Simply Modern Mom inspired, put photos of it up in the Flickr group to show it off to everyone. 1. 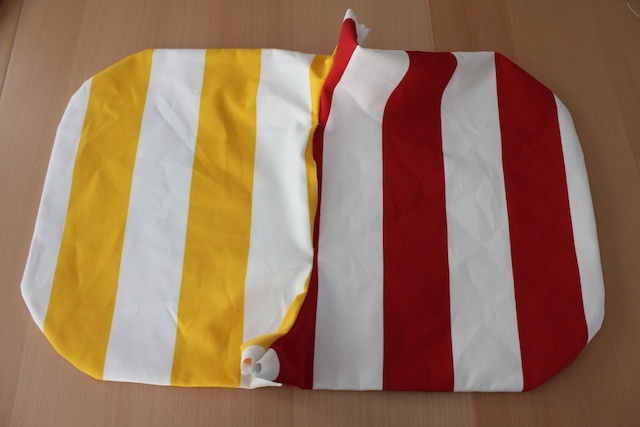 With 4 of the bag patterns cut out (2 of each color), match the right sides together. 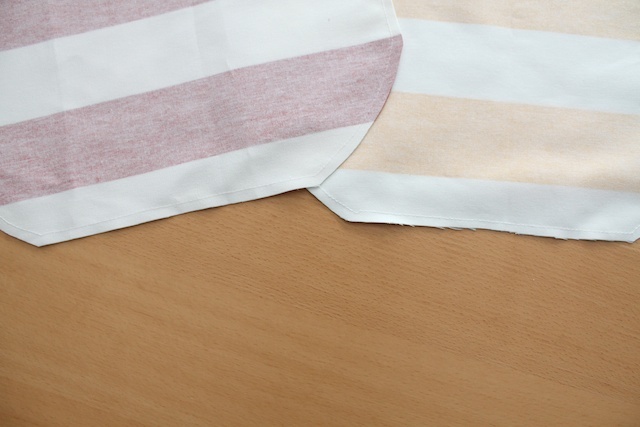 Sew the outer part of the bag of each colors. 2. Flip one of the color right sides out. Place it inside the bag that is wrong side out. Pin the top part together. Leave the top corners where it is supposed to connect to the handle. Don’t sew that part closed. 3. 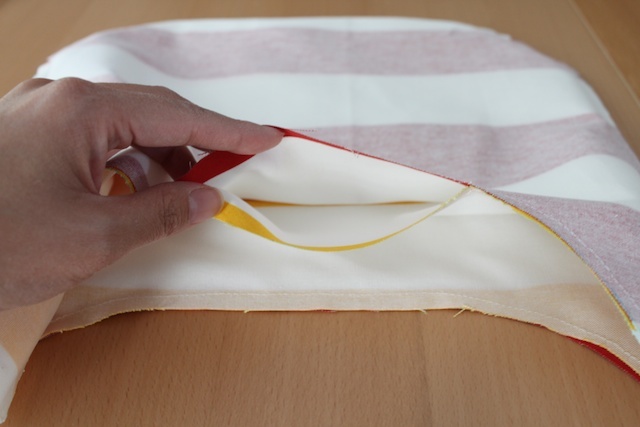 Now sew the top of the bag, leaving an opening large enough to put your hand in. 4. Using the opening at the top of the bag, pull the inside bag out so both bags are attached at the top and both are right side out. 5. Tuck one of the colors inside the other bag. Iron the sewn edges and the seam allowance of the opening for it to lie flat. 6. Top stitch the top of the bag all the way around, including the opening where you pulled the bag right side out. But not the handle openings, don’t sew those two parts. 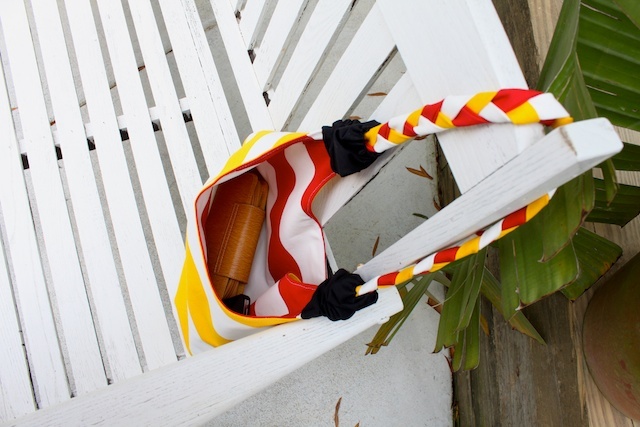 Pick up the Hobo Dance Bag tutorial from step 12 to finish the handle and the rest of the bag. And there you have it! 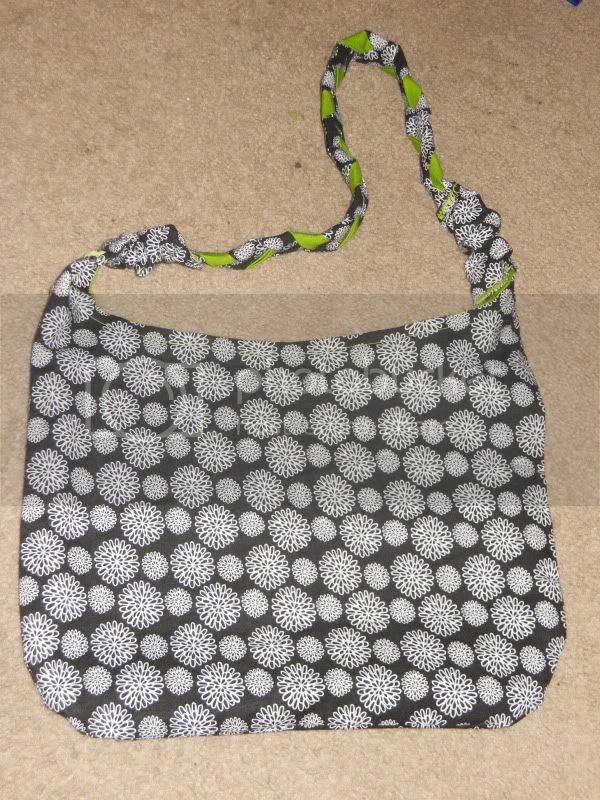 A reversible bag using the same pattern as the hobo dance bag. » Tell me… Do you have a purse you use when you are not carrying a diaper bag or do you always carry a mommy/diaper bag? 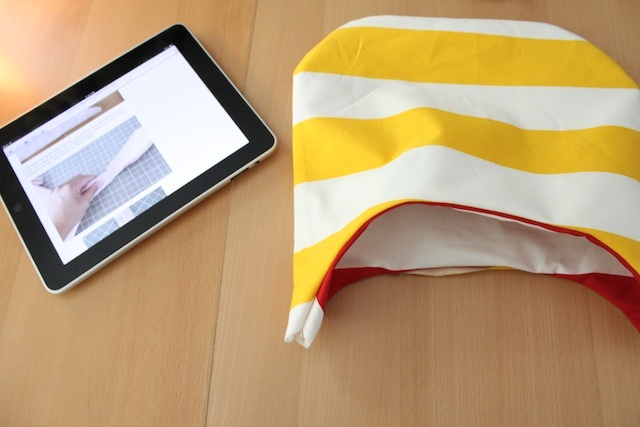 So please include how you to make and attach the handle…that project is too cute!!! Thanks for sharing. 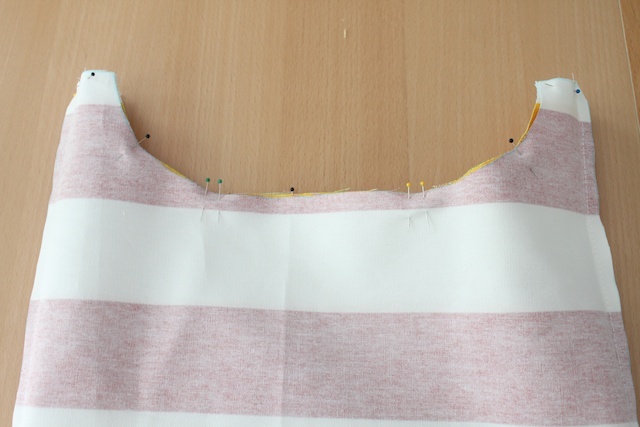 Or maybe add a zipper, but other than that it’s a great tutorial. So nice bag and the tuto is so great, very clear and easy to follow. I like it really so much. Simple and cheerful, two of my favorite things. That’s so pretty! I *love* the stripes you used! Thanks for the how-to, I’ll be linking. I just got a sewing machine for Christmas so I’m a real beginner, but I made the ballet bag for my daughter and she loves it! I’ve received a lot of compliments on it as well! Thanks so much for posting your great pattern, clear instructions complete with pictures, and cute ballet shoes stencil. I’m making one for my younger daughter too! This was featured today over at Today’s Top 20! Hooray! These are so easy to make! Thank you for the great tutorial. I made 2 of these and posted them to my blog. 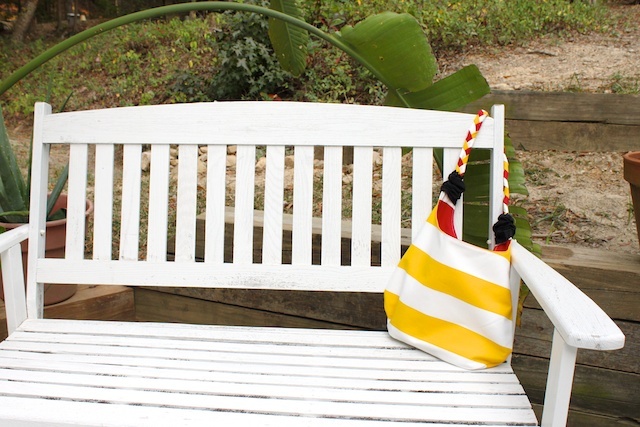 Since I’m new to the blogging space, I made one of the hobo bags to giveaway. I REALLY like your blog. I don’t think I’ve ever been here before. I’m actually out looking for a baby quilt tutorial I saw one time on the Sew Much Ado linky and I want to make it. But I may just do this one instead. Thanks for sharing! http://i39.photobucket.com/albums/e162/betsylala/e9512a03.jpg I think next time I’ll fashion a gusset for the bottom. Sigh…sorry, my browser went funky. 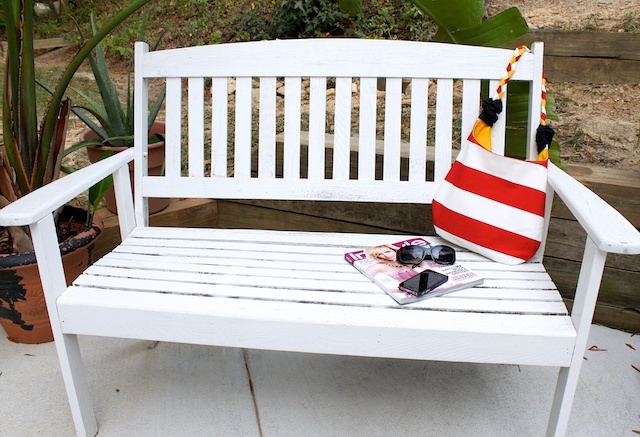 This is an absolutely adorable bag! I plan on making one and using it as a diaper bag for quick outings. 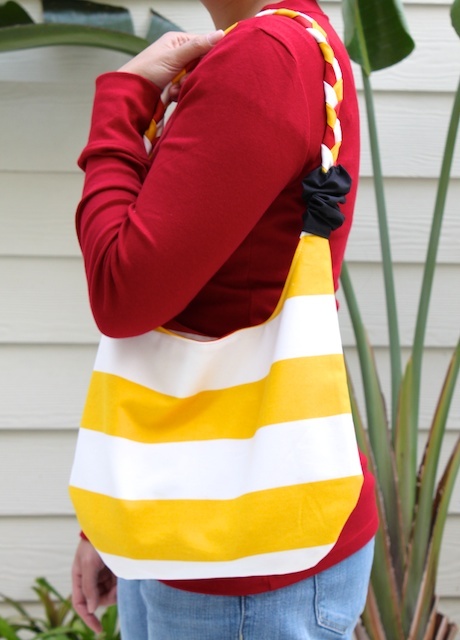 I have featured your tutorial on my site at http://www.patternsforbags.com in the hobo bags section. Thanks for the wonderful tutorial! 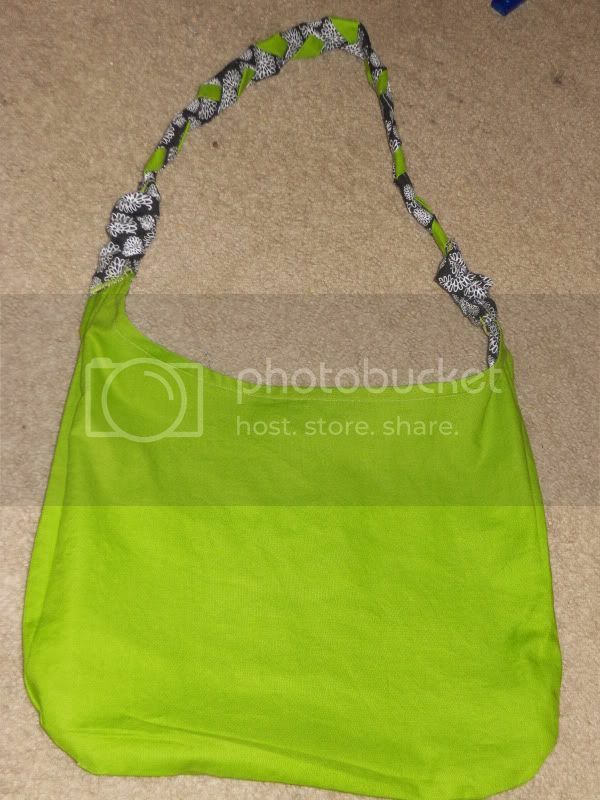 This tutorial is great:) ive been looking to make a hobo bag for a while and your tutorial is the best i can find! It’s easy to follow and great:)(: im only 14 and have only sewed once. Ever. So im a beginner but i think i can actually do this:) my only question is: how big is this bag supposed to be? I printed out the pattern but id like it to be big like a tote bag so we’re going to try and enlarge it. I went ahead and bought my fabric yesterday and im crazy excited:)(:!!! I made this bag and the instructions were really clear and easy to follow. I added a magnetic clasp, a pocket and a key holder. I made the strap just a little bit longer, so I can wear it across my shoulder, if needed.